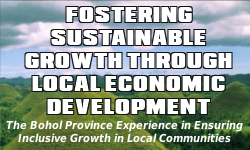 To continuously transform its social, economic, political and cultural life through effective collaboration of people from various sectors of the province to achieve and sustain its vision. Bohol is ushering in an area of cultural development in tandem with its promotion on tourism. The Provincial Government embarked on a cultural heritage preservation and development program sometime in 1997 which was ably supported by the National Government, the religious sector and civil society. The program has set the national pace in heritage conservation and has garnered several national awards such as the Galing Pook Award.